CHECK flyvninger til ST. MARTIN (SXM): flyver til ST. MARTIN (SXM) er lettere og billigere. Hvis man ser på flyvninger se ind flyver til St. Martin (SXM) * Flere hyppige flyvninger * Billigere flyrejser * Adskillige luftfartsselskaber kan være i stand til at bruge frequent flyer miles * Vi gør det nemt at følge anvisninger fra St. Martin lufthavnen til Marigot Bay; 20 minutter færge til Anguilla ... Paradis. Der vil du mødt af Nirvanas concierge og transporteret til Nirvana. Wonderful havet og øen udsigter vil underholde dine Kabale. Du vil straks slappe af d. .. KONTAKT OS FOR let at følge specifikke og skriftlige instruktioner .... TGYC! After a long journey with a few bumps in the road we arrived on Anguilla. We were greeted with warmth and friendliness right off the bat at Blowing Point and taken to our "Home Away" Villa Nirvana. We were welcomed by the delightful team of Kathryne and Gifford Connor and shown around our beautiful accommodations, given snacks and then served a most magnificent dinner by Chef Tyrone Hughes. He is the most amazing chef. We liked him so much we had him come back 2 more times. His food is exquisite, beautifully presented and very well priced. He and his staff ( #3 girl Malainia) were perfectly lovely. We would have had him come back every night if we could have, however he was already scheduled elsewhere. Our villa Nirvana was just amazing! The house itself is a very beautiful, clean and comfortable space, we were a party of 8, stayed for 10 days and hated to leave. The bedrooms were spacious with large ensuite bathrooms and very comfortable beds. Our living space inside and out was perfectly lovely. We never felt crowded ( even when we were all in the kitchen, which is huge!) The views were spectacular! Sunrises and sunsets, just amazing, we even got to see the "the green flash" on our last night there! We spent most of the time when we were at the house at our outside dining/living room area. It was so beautiful out there. The pool was a little chilly but very refreshing and enjoyed by all. We were very well cared for by our house keeper Rolyn and property managers Kathryne and Gifford. The owners and property manager went out of their way to make sure we had everything we needed including a specialty beer that they had to get from St Marrten! We never felt unsafe anywhere on the island. The people were friendly ( and it felt like a very genuine friendliness not a fake give me your money friendliness), and warm. Everyone we met was just so nice! The beaches are really very beautiful and the water is amazing! The beach bars and restaurants are lots of fun. We enjoyed an ATV ride, a lovely bird/nature walk and a snorkeling trip ( we just loved Pinkie). All of our guides were well informed and seemed to enjoy sharing their knowledge, their love and pride of Anguilla. Most people that we met would tell you they cannot imagine living anywhere else! We spent most afternoons snorkeling or swimming at one of the many beaches. Anguilla has done an amazing job recovering from the horrible hurricane in 2017. An A+ recommendation! Anguilla is a great place to vacation. Villa Nirvana on North Hill is like a second home to us. With children and grandchildren with us, it is a great place for family time. The staff and owners get an A+. Everything you need is there. Stunning Villa. Exceeded all of our expectations. Starting at check in we were impressed with the personal service provided. After a long day of travel we arrived late and were delighted to arrive to a delicious, unexpected meal waiting for our hungry family. The personal service continued throughout our entire stay. Private massages were arranged at the villa, and our hosts were able to answer all our questions and provide excellent suggestions for excursions on the island. Our hosts were even able to arrange for a car to be waiting at the villa for our use. This was a very nice treat. By far the nicest place we have ever stayed and combined with some of the best beaches in the world made this a delightful experience from start to finish. Hope this note finds you, Rodney and the family doing very well. Have been wanting to write and thank you for your kind words of support and care. Everyone at Nirvana very much enjoyed you and your family and your heartfelt words here make our efforts all the more worthwhile. Thanks You! Tammy & Rodney!!! My husband and I visited Anguilla for the first time, along with our adult kids and their SO's (8 total) in March '17. We've been to many Caribbean Islands, but Anguilla is, by far, our most beloved. First things first - a huge thank you to the hosts, Paul and Elise; they were so incredibly gracious and attentive in helping us plan EVERY detail of our trip. They truly do go above and beyond and treated us like family. We opted to take the boat Calypso to Anguilla from SXM and it was great fun(highly recommend)! Gifford met us at the dock with our rental cars and escorted us to Villa Nirvana. Upon our arrival, I think all our mouths dropped open, in sync, from the beauty that surrounded us. Kate greeted us warmly and surprised us w delicious BBQ, wine, beer and soda's. After a long day of travel it was much appreciated. Indeed, as Paul promised, we were in PARADISE! Villa Nirvana is quite gorgeous, yet it feels very much like a home. The villa is centrally located so everything is easy to get to. The indoor and outdoor spaces are beautifully appointed and the views are spectacular. The kitchen has everything you could ever possibly want or need. We chose to cook and enjoy a big breakfast at the villa every morning to start our day. Eating outside, first thing in the morning, to take in the views and plan our day was glorious. The infinity pool wow!! I would float and gaze out upon the ocean... dreaming of moving there permanently. We put the large outdoor grill to use two nights as well. On the second floor, where the main master suite is, there is also a beautiful outdoor sitting area which we used often to enjoy the sunsets and cocktails. One day we returned to the villa to find a box of chocolate covered strawberries in the fridge which was so thoughtful. Rolyn makes sure everything is clean and orderly every day. I can't tell you about our favorite anything as every day was the "best day ever"! Some highlights: Tapas and drinks at Meza; dinner upstairs at Veya. Dancing at Dad's and Pumphouse. Manoah Hotel at Shoal Bay East for lunch. Corner Pizza -just GO! Horesback riding on the beach with Tonia. Sandy Island is great fun. Garvey's at Rendezvous Bay. Blanchards Beach Shack - great lunch. Meads Bay - wow! Little Bay - jump the cliffs! Pimms and Mango's for dinner. St Bart's for the day via Anguilla Air Services makes it affordable. Finally, Anguillian's are so dear and friendly - get to know them. We can hardly wait to return! ABSOLUTELY FABULOUS from start to finish!!! 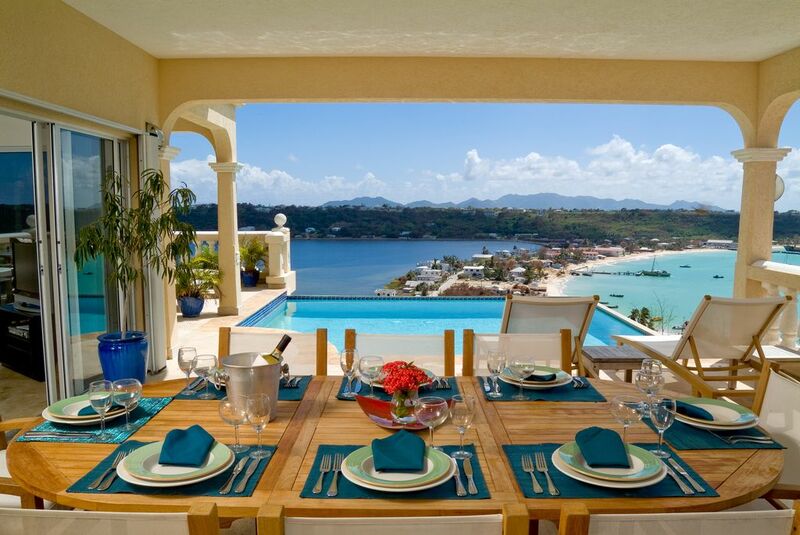 We took a group of 7 friends with us for our 5th trip to lovely Anguilla-- all of them for the first time. This was our first house rental as we have stayed in smaller accommodations when by ourselves. We could not have made a better choice with Villa Nirvana. Our hosts, the Connors, were so helpful and made our stay so nice. We actually had 2 dinners catered to eat in and they both were so delicious-- and our crowd appreciates a good meal! Delivered on time, excellently prepared and even had leftovers for other meals. The house is wonderful-- so spacious and comfortable and the views are gorgeous. We enjoyed the pool after days on the beach and spent a lot of time at the large table outside for meals and drinks. The kitchen is well equipped and it was nice to have 2 refrigerators for drinks, etc. The ice machine is a definite plus as well. All of the bedrooms and baths were great. We enjoyed the Master suite upstairs since I was the trip planner-- a nice perk! So comfortable and plenty of room. One suggestion would be to have twin beds in the "mother-in-law" suite---that would be more comfortable for guests using that room. My friend was more than comfortable sleeping on the couch, but the air bed (that would have been used by a friend who was not able to go last minute) was awkward and uncomfortable. Otherwise, it is a great room and there are plenty of bathrooms to share. The house was kept immaculate by Rolyn, although we never met her. All beds were made perfectly and plenty of fresh towels provided. She is amazing-- the house is spotless. We enjoyed taking everyone around the island. We rented 2 SUV's which were at the house when we arrived. All we had to do was go by the car rental office to sign the paperwork a few days later. I drove the 2nd car, my first time on Anguilla, but not first time on the left. So easy to get around-- just a little tricky on the dirt road at times leading to the house depending on whether it is raining or not. The house is in a great location on the island and very central to everything. Another great thing is having a toll free phone for calls home and a house phone for local calls-- takes the hassle out of planning how to use your own cell phone when on island. We appreciate everyone who provided us with all the information we needed to make this trip possible. Paul and Elise were wonderful to work with state side and Katie and Gifford Connor were equally as helpful in Anguilla. I have no doubt we will be back! OH, the view inside and out! The amenities and phenomenal view earn this villa my 5 star rating. Everything we needed for our dream vacation was provided without having to ask. Loved the personal attention from the owners, manager and housekeeping staff. Thank You A Bunch Nicole..
We feel a little like Walt Disney might have. As was also a theme in NIRVANA... "Your wish, my lord and lady, is our command!" It is what make us all feel appreciated because we truly care about our guests' experiences. Your loving staff at Nirvana on Seafarer's Ridge in True Paradise! Golf: 18 hullers championship golfbane kun 10 minutter væk. Stor bane med store gebyrer. Kom og bare spille! Please add 10% for government tax Nirvana's rental rates are an EXCELLENT value. When using all 4 bedrooms, the usual cost per bedroom suite per night ranges between $240US to $329US. Nirvana is a true SUPER VILLA with pool, fully air-conditioned and wonderful views. Plus, with our concierge service's insight, you still pay only $1 for a Heineken at Nirvana just like at home.